The jury is still out on how I feel about Blood Pressures, the newest album by The Kills. It’s complicated. I do know for certain that I love the band The Kills, and in this case the sum of their parts is enough to keep me listening, as well as quick to score tickets to their much-anticipated return to Seattle on Monday. (Sadly for fence sitters, The Showbox at The Market appearance is currently sold out; though they’ll return for Bumbershoot in September). Blood Pressures is a “quality” rock record: it pricks the ears and won’t leave you feeling as if you just got hustled. 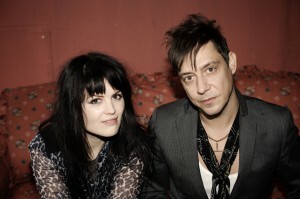 But it does seem like the fire in the bellies of co-conspirators Jamie Hince and Alison Mosshart has cooled almost imperceptibly. “The Future Starts Slow” kicks off with the same mix of stark, satellite-calling guitar, big clicking beats, and cooler-than-cool vocal interplay that’s made the duo what they are. “The Heart Is a Beating Drum”, “Nail in My Coffin”, and “DNA” are thumping and raw, though perhaps more polished than the beautifully frenetic Midnight Boom. Which isn’t a bad thing exactly- no band can survive by releasing the same records over and over again. Mosshart’s swagger and blues have been perfected through constant work with Hince as well as her many other musical endeavors (most notably The Dead Weather). She’s definitely up there with PJ Harvey and Karen O in the modern list of true great women in rock. “Baby Says” and “The Last Goodbye” show Mosshart’s soft underbelly. “Damned if She Do” and “Pots and Pans” feel a little unimaginative (maybe even bored), but “Wild Charms” is the only true throwaway. There’s no need for Hince to show how he can perfectly mimic a Beatles song in an outtake; there’s so much more The Kills should be famous for. Written by: angrytruffle on 05/07/2011. This entry was tagged posted by jessica price, The Kills. Bookmark the permalink.